In today’s Internet driven environment, a company’s business computerized management system must efficiently incorporate and integrate all aspects of its sales and inventory functions into one program that seamlessly processes and tracks activity in both areas. Real time data is required to keep up with sales volume and ensure that inventory levels are adequate to meet demand. The speed, efficiency and accuracy of an integrated POS and inventory tracking system is essential to success in a competitive global retail market. 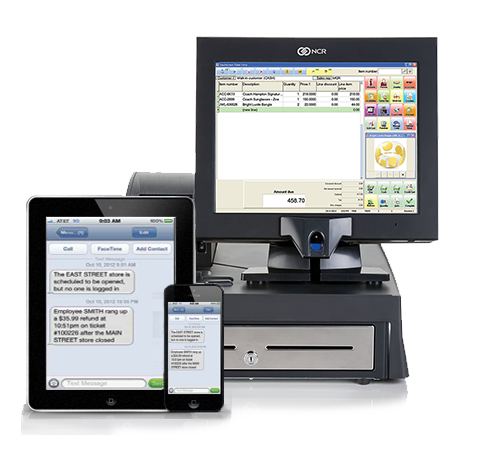 NCR’s Counterpoint POS is a top of the line computerized POS and Inventory Management System designed for small and medium size businesses to integrate product sales with inventory levels in real time. The program simultaneously records and tracks POS information and updates inventory as products are sold and issued from the inventory. Each function also performs other important and useful actions. POS , point of sale, activities revolve around sales transactions and advertising products. Sales drive profit and Counterpoint POS gives businesses the ability to do email marketing, gives potential and existing customers access to online purchasing and payment that includes credit card approval. With NCR Counterpoint, a business can also gain exposure by smoothly conducting and managing online marketing campaigns. Counterpoint’s email marketing module enables businesses to segment customers by one of several data points in the customers’ records database. This feature allows companies to effectively tailor e-marketing efforts to specific online customer groups. One of the important administrative features of the system is the Alerts module. The function monitors potential fraud situations, employee hours and sales receipts. The Alerts module also generates several useful reports on these and other activities. The goal of Inventory Management, or IM, is to ensure that the correct parts are always in stock at the correct quantities. NCR’s Counterpoint Inventory Management System (IMS) accomplishes that goal with features that seamlessly link sales, demand and product availability. The program compiles a complete description of every item in the inventory so that items can be searched using several criteria. Each item is also assigned a unique part number in addition to the item’s original description, SKU and serial number. Products can also be assigned barcodes that are a more efficient way of receipting and issuing items to and from inventory. The IM module offers several other features. The inventory can check for accuracy and parts density through a function that randomly selects items for count on a frequency determined by the user. The module also has the capability of generating several inventory management reports to monitor the efficiency of the operation. Most importantly, Counterpoint’s Inventory Management function directly links sales activity to product inventory levels. As products are sold, the number of an item sold is automatically subtracted from its balance on hand by the inventory tracking system. When the item reaches a predetermined balance, it is automatically reordered by the system. This link between sales and inventory is at the heart of Counterpoint. Counterpoint is a complete and intuitive system. Check out www.counterpointpos.com to learn more about the system.